Tired and dejected, we opted for a healthier meal at a nearby classy coffee shop (forgot the name) just beside UNIQLO Huaihai. HB ordered a freshly prepared pasta dish. I had one of the house specialties - a set meal with chicken sandwich and a vegetable salad. When my order came it did not appear to be appetizing. 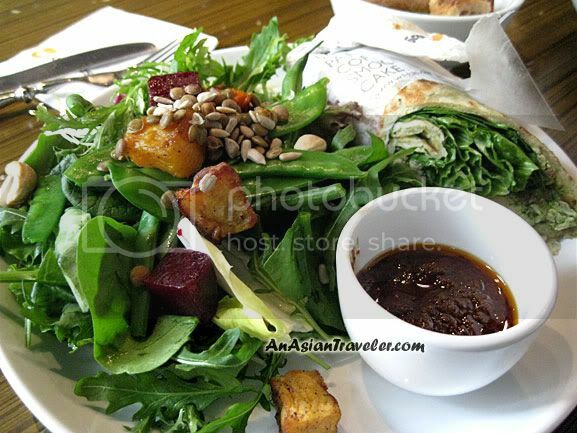 I stared the white giant plate with a very huge serving of purely raw green leafy vegetables. Some of the veggies are somewhat very new to me. Note: This post is the continuation of our Shanghai, China trip. yum! the food looks good! though salad without dressing does not sound too enticing. hehe!